You’re on Antonio Brown Fantasy Football Names. Please know that what “Brown can do for you” has more meaning if you’re a Raiders’ fan! Say goodbye to the Steelers; it’s time to just win, baby. 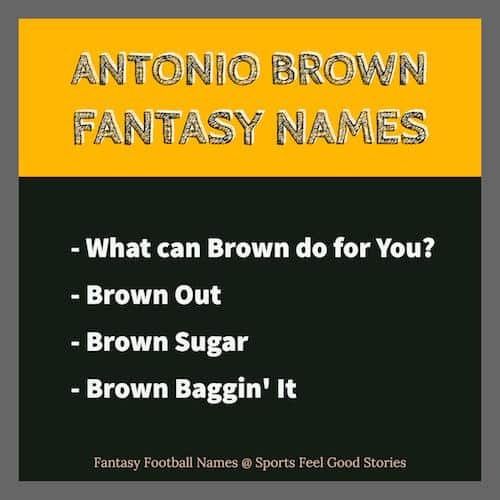 These Antonio Brown fantasy football names will have you dancing like, well, Antonio Brown. His appearance on Dancing with the Stars had folks talking about him that haven’t watched much football at all. One of the most dynamic players in the whole league, Brown can literally be a one-man scoring machine. Three touchdown games are not out of the ordinary. An ability to get open and great hands are two great tools for any receiver. Brown uses them well. Check out these fantasy names for the Oakland Raiders leading wider receiver. Brown likes to swim in the off season to stay in shape. Given his success, maybe other receivers should be heading to the pool. Like walking, swimming is considered a great training sport by many fitness experts. In addition to working on aerobics, it builds strength and is easy on joints and ligaments. Check out all the Raiders Fantasy Football Names by clicking on graphic above. Why does Antonio Brown wear number 84? Drafted 195th in the 2010 draft, Brown saw all of the teams pass him by several times. The number 84 reminds him of that fact. Eight times four equals 32 which is the number of teams in the NFL. Hmm, to think he uses his jersey number as a constant reminder that others didn’t think he belonged at the top. You can’t argue with the success that this type of motivation has given him.